There you have the Obama administration. It will defend human rights and democracy, but only when it’s suitable. And usually when lip service to human rights serves some other end. We saw a similar dynamic play out in the first year of the administration, when Obama’s “outstretched hand” to the Iranian regime led him to slight the “Green Movement," a precursor to the Arab Spring uprisings that was subsequently crushed. In this case, the administration was just gearing up for a major strategic shift aimed at encircling China with allies old and new, and Myanmar, long isolated by Western sanctions, was deemed a key player. All of which suggests that if there is any president that Barack Obama most resembles right now on foreign policy, it is probably Richard Nixon, the master practitioner of cynical realpolitik. Except rather than opening China to outmaneuver the Soviets, 40 years later he’s opening Myanmar to outmaneuver the Chinese. And just as Nixon and his foreign-policy impresario, Henry Kissinger, never paid much attention to human rights, Obama is treating them as an afterthought as well. It sounds fairly self-serving. Yet the historical odds are that Obama’s gambit – the short-term sacrifice of human rights for a longer-term triumph of American influence in the region – will work in Asia. First, China’s Communist mandarins are hardly in a position to aggressively counter U.S influence-building. Under newly anointed leader Xi Jinping, Beijing in a delicate transition of power and will, perforce, be even more inwardly focused now than it has been for the past several decades. China’s great growth machine is slowing down, and its leadership is tarred by headline-grabbing corruption scandals. Now the Chinese Communist leadership, which has stayed afloat (long after the Soviet Union collapsed) by supplying three decades of astonishingly fast growth, faces a politically harrowing game of trying to act like a rising economy when it is becoming a maturing one—of continuing to stoke enough export growth to keep its population happy enough to avoid another Tiananmen Square-type protest. It desperately needs U.S. and Western markets for that. Meanwhile, under Obama, the United States is simultaneously beefing up its partnership with India, renewing military ties with the Philippines, and assembling a trans-Pacific trade partnership that doesn’t include China (but could, if Beijing agreed to tougher labor, intellectual-property, and environmental restrictions that it has previously spurned). The strategy also explains the opening to Myanmar, which lies on China’s southwestern border. U.S. officials refuse to call the policy “containment” or “encirclement.” Instead, James Steinberg, the former deputy secretary of State, says the new “paradigm is that the best way to positively engage China is from a position of confidence and strength,” demonstrating that Beijing “is not going to have the option of pushing people around.” Obama hopes to get the same sort of result his erstwhile GOP opponent, Mitt Romney, promised during the presidential campaign: a China that does a better job of observing international norms, whether on trade or human rights. And what of China’s vaunted financial leverage? (As Secretary of State Hillary Rodham Clinton put it in a now-famous conversation with Australia’s prime minister published by WikiLeaks, “How do you deal toughly with your banker?”) Strategists believe that China’s financial power is exaggerated as well: In truth, Beijing owns only about 8 percent of U.S. debt. And Japan, a reliable U.S. ally that’s likely to remain one, recently moved back past China as the largest holder of U.S. debt. As World Bank President Robert Zoellick writes in the current issue of Foreign Policy, quoting Bob Carr, Australia's foreign minister, "The United States is one budget deal away from restoring its global preeminence." As far as change to Myanmar goes, the country is still run by an ex-general, Thein Sein, who likely still answers to another general, Than Shwe, the officially retired senior junta leader. It is also clear that Suu Kyi has weakened her resolve somewhat from the early days when she demanded the regime give up power and restore her party's place after it won an overwhelming electoral victory in 1990. 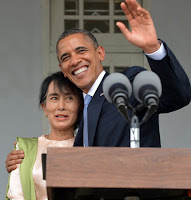 Now, Suu Kyi will be working with her captors rather than defying them, and America will be welcoming another set of repressive dictators into its circle of trust. A gradual lifting of U.S. sanctions will permit eager U.S. businesses to rush into the impoverished but mineral-rich country. Yet despite the marginal pressure being put on the regime now, history shows that engagement works much better than isolation. The key to the destruction of the Soviet Union and its sphere of influence, the East bloc, lay as much with the Helsinki Final Act signed by President Ford in August 1975 as it did with Ronald Reagan’s arms buildup. As part of an agreement, Moscow signed onto vague promises of “human rights and fundamental freedoms” that eventually inspired “Helsinki monitoring groups” in East-bloc countries, most famously Charter 77 in Czechoslovakia. Thus, Helsinki helped to engender the dissident movements that blossomed in the 1980s and eventually destroyed the Soviet bloc. So, despite the outcry from human-rights activists who oppose Obama’s visit, even filmmaker Bob Lieberman thinks the president’s policy is right, despite his snub from the U.S. Embassy. “I think it’s a good idea that he is going,” says Lieberman. “It forces them into the 21st century.” If Obama is right, the same thing will happen to China. Michael Hirsh is chief correspondent for National Journal. Hirsh previously served as the senior editor and national economics correspondent for Newsweek, based in its Washington bureau. He was also Newsweek’s Washington web editor and authored a weekly column for Newsweek.com.